With the powerful knowledge of Ayurveda, in your home garden, you can grow three fruits that are an ancient recipe for health and nourishment. In your own home garden you can create a fruit powerhouse that protects you from disease and makes you healthy and strong – physically and mentally. 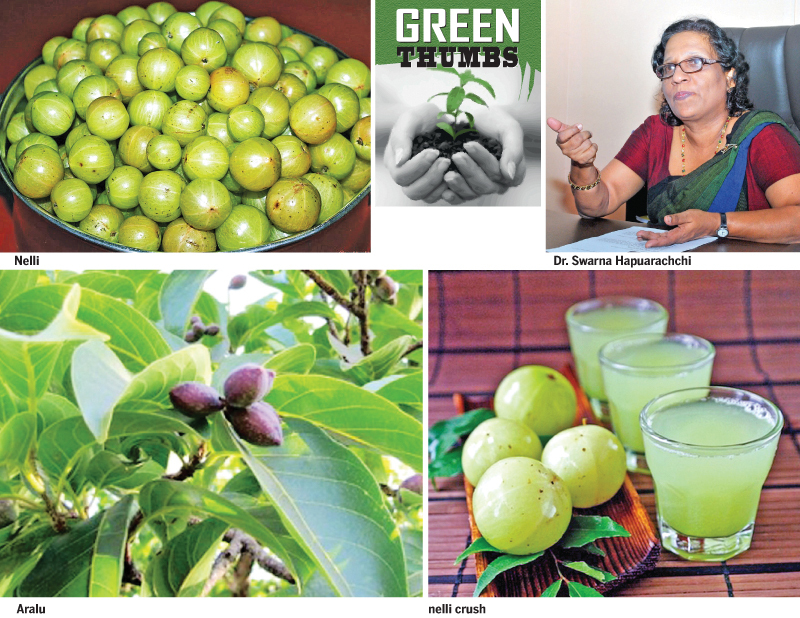 Green Thumbs speaks to Institute of Indigenous Medicine, Department of Dravyaguna Vignana, Senior Lecturer, Dr. S. D. Hapuarachchi on the Triphala, a combination of Nelli, Aralu and Bulu. Triphala means three fruits. (Tri = Three and Phala = Fruits). Much of Ayurveda medicine consists of these three fruits - Aralu (Terminalia Chebula), Bulu (Terminalia Bellirica) and Nelli (Emblica Officinalis). Triphala is one of the oldest and most powerful Ayurvedic medicine which is used by all Ayurveda or traditional physicians in their therapeutic practice. It is an Ayurveda herbal formulation that has a wide range of curative powers and is applicable to a broad range of ailments and helps maintain a state of good health in the mind and body. “If you take the Aralu plant, it has been widely used for many centuries in both Ayurvedic and Tibetan medicine. According to Tibetan culture this plant is called the ‘King of Medicine’. It has a variety of positive health effects on the heart and brain. It decreases stomach acidity and guards against ulcers. It reduces the risk of developing stomach ulcers. The Bulu is another excellent plant to grow in the garden. Bulu is a powerful ancient detoxifier with detoxifying qualities on the blood, muscles and fatty tissue of the body. Bulu is very useful with conditions involving excess mucous in the system and is also good for quality bone formation. Nelli is another plant which is vital for the home garden. It is low in calories and it is made up of over 80 percent water. Nelli or the Indian Gooseberry is considered to be a super food,” explained Hapuarachchi. Nelli is a delightful tasty fruit and the best way to consume the fruit is to eat it fresh. The fruit can also be juiced, pickled, cooked or converted to cordials. This well- known fruit, which can be converted into the refreshing juice Nelli Crush, is freely available, with a tree in almost every home garden. Aralu is another fruit, the size of a large plum. Reliable sources on the web tell us that it may be eaten raw, dried or boiled. It can be acquired whole, dried, powder or liquid form, taken as a decoction. Hapuarachchi being an expert on ancient herbs of Ayurveda disclosed some little known facts about the Ayurvedic background and dynamics of Triphala. According to Ayurveda we are made up of the five elements. These five elements (Maha Bhutas) are Earth (Prithivi), Water (Jala), Fire (Agni) , Air (Vayu) and Space (Akasa) and the combination of these elements give rise to Three Doshas - Vata, Pitta and Kapha in the body. “Three Doshas are the three fundamental energies which govern the function of our bodies on the physical and emotional level. Each individual has a unique balance of all three of these energies. They are biological energies found throughout the human body and mind. They govern all physical and mental processes and provide every living being with an individual blueprint for health and fulfillment,” pointed out Hapuarachchi. Triphala contains five of the six tastes recognized in Ayurveda – Sweet, Sour, Bitter, Pungent and Astringent. It is only missing the salty taste. Ayurveda identifies the six tastes as – Madhura (Sweet), Amla (Sour), Lavana (Salty), Katu (Pungent), Tikta (Bitter), and Kashaya (Astringent). These are the main tastes in plants. These six tastes are actually the five Bhutas in different concentrations. These tastes which are necessary for health and well-being, also balances the three Doshas. “Another fact that needs to be noted is that Triphala Churna is a 2000-year-old traditional Ayurveda herbal formulation and is basically the powdered form of Triphala. It is ideal for curing various health disorders, especially the ones related to the digestive system. It is dated back to 1500 B.C. in Ayurveda texts. 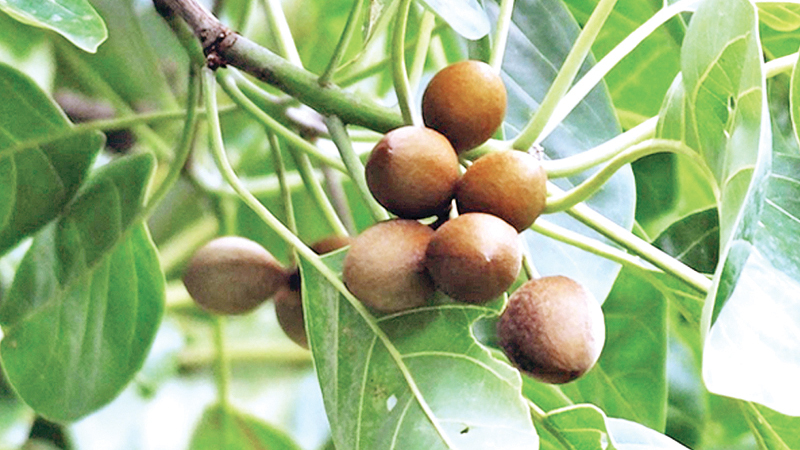 Triphala powder treats a number of issues from weight loss to Diabetes. It also acts as an anti-inflammatory agent as it is used to treat arthritis and reduce inflammation. It also has anti-oxidants and is used to prevent or delay ageing. It also has some anti-cancer properties,” said Hapuarachchi. Of course when taking Triphala it is always advisable to consult your Ayurvedic doctor as there are side effects. Triphala may be a wonder medicine but there are side effects. “In our studies we have found that Triphala is able to suppress the multiplication of cancer cells. In the world we live in obesity has become a health issue. We have also found that in studies conducted, subjects that consumed Triphala, experienced a significantly greater decrease in weight, compared to subjects who were not taking Triphala. When it comes to arthritis, we have found in studies conducted, that Triphala has a positive effect on rheumatoid arthritis. Bleeding gums is another issue most people have. While visiting the dentist is excellent, Triphala is said to have success in curing these ailments. Its high content of Vitamin C helps in Anemia. Plaque is a horrifying problem with Cholesterol combining with fat, calcium and other substances in the blood to form plaque. It then hardens in the arteries. This can cause heart attack or stroke. Triphala has been found to reduce cholesterol and arterial plaque. In addition to this, Triphala improves digestion as well as regulates bowel movements,” explained Hapuarachchi. Triphala is an amazing healing agent with anti-inflammatory and antimicrobial properties that speeds up the healing of wounds. This anti-inflammatory characteristic makes it cure and prevent anything from joint pain to bronchitis. This is one reason it has been around for such a long time - for centuries, from medieval times to this age of technology and modern day medicines. Triphala powder can prevent bacterial and viral infections.